Looking for the tutorial on making a secret toekick drawer? We've moved the blog over to Tikkido.com! Find the full tutorial and all the pictures over there. This is fantastic! would be the perfect drawer for lids! The top photo is the finished product with the drawer closed. You can't detect at all that the toe kick is in fact a very small drawer. 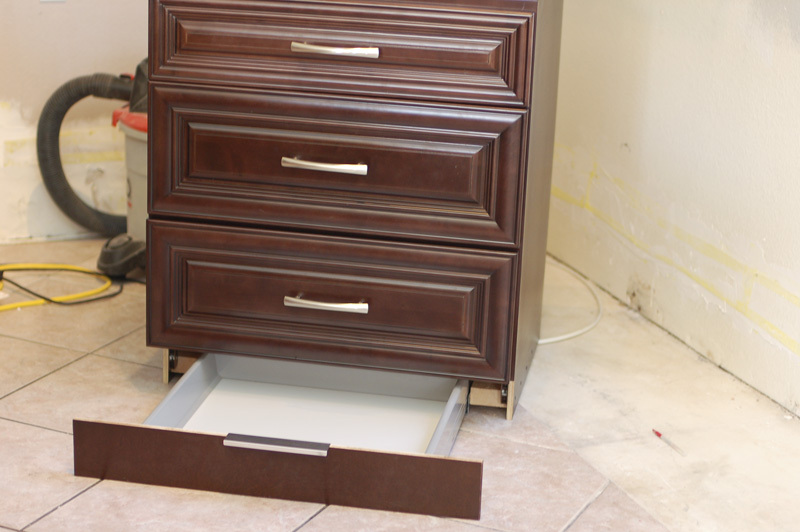 This would be a great idea for hiding valubles under a Master Bath vanity. Whatcha think? It is really important that my wife never see this. It would cut seriously into my play time. Actually, this is great. Besides the obvious extra storage, it is a better place in a lot of ways than a hidden safe, since no one will ever think to look there unless they yank the draw above it out totally. They would NOT see it even if they yanked the drawer above it out. That drawer has a solid bottom underneath it that is part of the cabinet. See picture 3 and 4? This is such a great idea and I'm going to get my husband to install these when we have our kitchen redone in a few weeks time. I have a question though...for a 30 inch cabinet, could you use a 30 in drawer instead of a 24 inch one? In your case, the drawer would have a width of 28 1/4 inches and your cabinet has an interior width of 28 1/2 so there would need to be some sort of support of about 1/8 on either side. Is there something I am missing? It would give an extra 6 inches of drawer width which would be awesome. Very useful guide. Toekick drawer is an excellent furniture addition. Good job on improvising a toe kick drawer. I like how you simplified the steps so that anyone, even a child, can do it. Another thing, it would be a good idea to remove the handle of the drawer. This way, you can keep valuable kitchen tools secured from your kids and visitors. It’s a good idea to remove the handle of the drawer, Lara. It would totally be the right place to hide all your sharp kitchen utensils and some of your important things as well. Great work done with creative ideas. It prove useful for all those who are planning to rennovate. looking wonderful. I'm thinking that you could add the kind of gizmo (senior moment here) whereby the drawer or door opens when you press it. Wouldn't that work here instead of a handle, then it would REALLY be a 'secret drawer'. If you're a woman, then I commend you for knowing how and figuring out how, what and where to do things. You go girl!! Nice I also share with you something hope this helpful for you my friends. Here’s a great design tip for kitchens – the stove/cooking area, sink, and fridge are best when they form the three corners of a triangle. This works for both big and small kitchens. This makes it easy to maneuver around the kitchen because you go from point A to point B to point C easier. Preparing and cooking food becomes easier and unencumbered. It’s also logical layout from an electricity and plumbing standpoint because this would keep gas lines and water pipes away from each other. Investing in Kitchen Renovations Sydney will cost you thousands of bucks. The kitchen designer’s input will help you to have most out of the renovation work. You can have tailor-made solution for your kitchen renovation.